St. Thomas University School of Law’s mission “emphasizes lifelong learning and scholarship in a personalized, caring environment under Catholic auspices with a diverse student body and faculty.” The school is devoted to “training lawyers sensitive to the needs of the region’s underrepresented communities, and to expanded access to professional opportunities which includes active partnerships with business, government, and the South Florida Community.” The Law School is part of St. Thomas University, an urban, student-centered Catholic university with rich cultural and international diversity, dedicated to developing leaders for life. Founded in 1984, St. Thomas Law has for over three decades consistently adhered to its mission of providing opportunities for those groups who have historically been underrepresented in the legal profession. St. Thomas Law is one of the most diverse law schools in the nation, having been recognized for that honor by numerous publications. Indeed, within the past year, Hispanic Outlook in Higher Education magazine named St. Thomas Law as the number one school in the country for Hispanic students. As described by our students, quoted in The Princeton Review Guide of the Best Law Schools (2016 edition), St. Thomas University School of Law “offers ‘a small, tight-knit community’ that truly wants to see its students thrive and succeed.” Consistent with our mission, St. Thomas Law was one of the first law schools in Florida to require pro bono legal service as a requirement of graduation. Students must complete at least 50 hours of pro bono services to the community, though a significant portion of the graduating students exceed that minimum threshold. This past year, the student body collectively contributed over 20,000 hours of pro bono services to the community. This past year, St. Thomas was ranked in the Top Ten Law Schools for Pro Bono Graduation Requirements by the Super Lawyers publication. Since its founding, St. Thomas Law has grown in size (from a student body of 300 to one of approximately 700) and depth: it has added two LLM programs and a JSD and expanded its clinical programs. In 2001, St. Thomas launched its LLM program in Intercultural Human Rights, which has brought over 400 students to our campus since that time from over sixty different countries in the world. In addition to that LLM, St. Thomas added an LLM in Environmental Sustainability as well as a doctorate (JSD) in Intercultural Human Rights. St. Thomas offers a broad array of clinical programs (eleven), ranging from Immigration, Appellate Litigation, Elder Law, Pax Romana United Nations Internship, Florida Supreme Court Internship, Tax Clinic to Civil and Criminal Practice Externships, among others. St. Thomas University School of Law, with its graduate program in Intercultural Human Rights, has been a leader in the struggle to combat human trafficking throughout the world. The School was awarded a $500,000 grant by the U.S. Department of Justice to combat, prevent, and ultimately eliminate human trafficking. To that end, St. Thomas founded a Human Trafficking Academy in 2011 that focuses on education, research and outreach. The Academy has certified over 450 professionals of various disciplines in the field through its intensive and interactive courses, taught by top-level experts and practitioners with extensive experience in the field of anti-trafficking. Furthermore, St. Thomas Law‘s Human Rights Institute provides pro bono legal services to low income persons in many different areas, including administrative, family, general civil, housing and immigration law. The Institute is funded by federal, state, and local grants. The Cuban-Haitian Immigration Program (CHIP), provides legal services to Cuban or Haitian entrants, parolees, or asylum applicants who reside in Miami-Dade, Monroe, Broward, or Palm Beach County and who have been in the United States less than five years since their date of arrival. The program is funded by the Department of Health and Human Services and administered by the Florida Department of Children and Families. Within this past year, the Human Rights Institute, whose Director is an alumna of St. Thomas University School of Law, has handled approximately 6,000 cases for Cuban and Haitian clients. Our alumni, now over 5,000, have gained recognition in both the private and public sectors throughout the State and across the country. We have alumni in many of the major law firms (ALM 250), many of whom are partners in those firm – for example, Holland & Knight, Baker & McKenzie, Bilzin Sumberg and others. Many of our alumni are members of the state judiciary and federal agencies, with an alumna being recently appointed as an Administrative Law Immigration judge in Houston, Texas. We have a graduate who served as Interim Secretary of the Department of Children and Families in Florida and more than a handful of graduates who have served in the Florida Legislature. Our graduates have lived our mission and values as a Catholic institution dedicated to the dignity of the human being. We have a graduate who has adopted a victim of human trafficking, students who are helping unaccompanied immigrant children, and a powerhouse group of graduates who make up nearly half of the legal team at Dade Legal Aid. One alumna who represents our mission recently secured a $17.4 million verdict on behalf of five women who were sexually harassed and molested by their employer in Hendry County, Florida. Victoria Mesa-Estrada obtained her J.D. and LL.M. in Intercultural Human Rights at St. Thomas Law. She worked for two years on the case, but was laid off just months before the trial. Nevertheless, she stayed on the case to achieve a symbolic victory for her clients. The verdict, though uncollectible, delivered a message to the agricultural industry that the rights of migrant workers would be vindicated. This fall, the Law School will be launching the EDGE program. “EDGE” stands for Entrepreneurs Dedicated to Giving Back and Excellence. This “incubator” program will assist new graduates who seek to pursue either a solo or small practice make the transition from law school to their goal of beginning their own practice. It will give the participants reduced rental office space and mentorship in exchange for a minimum of 100 hours of pro bono services. 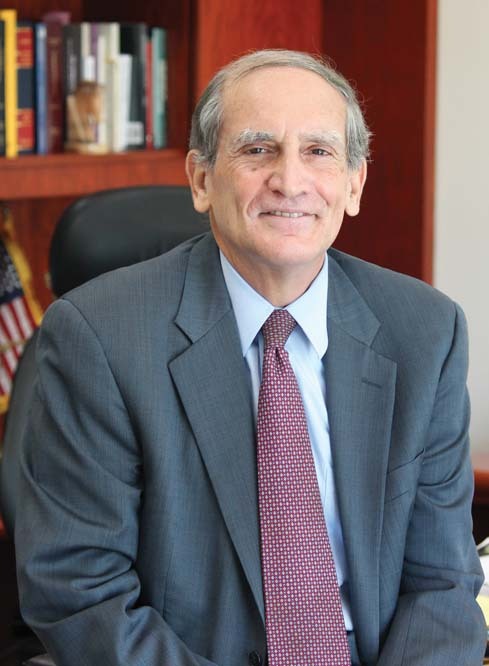 The program will be directed by former Third District Court of Appeals Judge David Gersten. As the cost of legal education has risen dramatically in the past decades, St. Thomas Law, like many other law schools, confronts the challenge of making law school more affordable, particularly for those students from humble backgrounds. One of the key priorities of the St. Thomas Law School administration is to increase endowed scholarships, both merit and need-based, in order to defray the cost of tuition and to build a lasting legacy for students who matriculate in the future. The law school’s alumni and distinguished Board of Advisors have made a significant commitment toward achieving that goal. Finally, we are proud of our faculty, dedicated and accomplished teachers whose cutting-edge scholarship and service to the academy, the local, national, and international communities have led by example in accomplishing the university’s mission of developing leaders for life.